Enjoy the best of cooking wherever your travels may take you with Thermomate Portable Ovens, an exclusive online offering by Mytopia. Wake up to the crisp air of the outdoors and enjoy some bacon and eggs. Perfect for campers, caravanners and outdoorsmen, expand your menu with the Thermomate Outdoor Camping Oven. Just hook your Thermomate to an LPG bottle and you can enjoy the pleasures of good comfort food while outdoors. With two brass stove top burners and an oven burner, unlock the power of a home oven and cook top with your Thermomate Outdoor Camping Oven. With Thermomate, you can enjoy the comforts of freshly baked bread, scrambled eggs and hotdogs in the middle of nowhere. The heat-efficient oven box ensures optimal insulation, while the durable stainless-steel constructions guards your Thermomate from corrosion. It even comes complete with an oven thermometer, two oven racks, and bonus roasting tray. Fulfill all your outdoor needs with Mytopia’s extensive range of affordable and durable Inverter Generators, Solar Panels, Camping Washing Machines, Portable Showers, Paddle Boards and Gazebos. 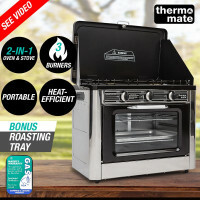 Product reliability assured that all Thermomate Portable Ovens are backed by an Australian standard 12-month warranty for private household use. Mytopia guarantees fast and easy delivery to all corners of Australia, whether you’re in Sydney, Melbourne, Perth, or in the Outback. Buy a Thermomate Portable Oven today and realise all your outdoor culinary dreams.